An establishment known as the Town's Hospital and Poorhouse was founded in Glasgow in 1731. It was located at the Old Green on Great Clyde Street, at the junction with what is now Ropework Lane. The institution was managed by the Lord Provost and a group of 48 directors: 12 elected by the town council, 12 by the General Session (representing the church in each parish), 12 by the Merchants' House (the merchants' guild), and 12 by the Incorporated Trades (the producers' guild). The Hospital was intended to 'aliment and educate upwards of one hundred and fifty-two old men, widows, and orphans of the city'. The original H-shaped building was much admired for its palatial appearance. It was later supplemented by a new infirmary block at its rear, with accommodation for lunatics in its basement — often flooded by the river nearby. 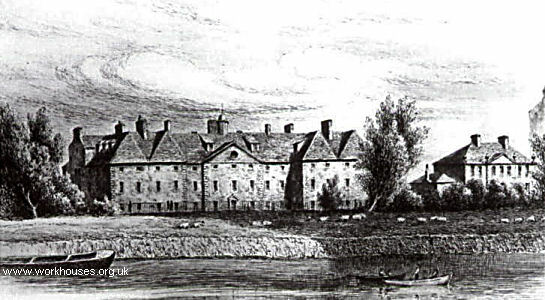 To encourage the destitute to make use of the poorhouse, the directors decreed that inmates were to 'enjoy a desirable measure of liberty, good comapny. convenience for retirement, peace and quiet, freedom from all hurtful toil and care, with good provisions, liberty to go to church on the Sabbath and to week-day sermons and to see their friends, with abundant means of instruction and edification'. A year after it opened, 61 old people and 90 children were in residence. The Town's Hospital was closed in 1844. The Glasgow City Poorhouse (also sometimes known as the Town's Hospital after its predecessor on Clyde Street) was opened in 1845 in premises at the north side of Parliamentary Road, to the west of its junction with St James Road. The building was originally erected in 1809 as the Glasgow Lunatic Asylum. 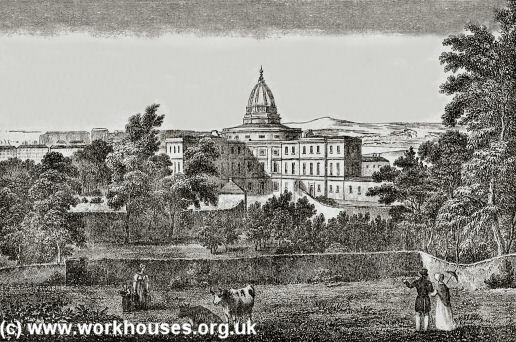 With 1,500 beds, the City Poorhouse was one of the largest pauper institutions in Britain. Inadequate separation of sick and able-bodied. Very poor sanitary arrangements such as badly sited and separated water closets. The use of water closets as sculleries and pantries. Poor bathing facilities — in one instance, 290 male inmates took their weekly bath in two baths, a process which took from 7am to 7pm. Badly lit and ventilated day rooms. Many of the buildings problems were aggravated by its location on a very busy main road near to the North British Goods Station. The City Poorhouse closed in 1905 following a merger with Barony parish. With the creation of a single poor law authority in Glasgow, three new establishments were built: Stobhill Hospital, and the Eastern and Western General Hospitals. A poor law hospital was built Stobhill in 1903-4 at a site on the northern boundary of the city. It provided accommodation for the infirm and chronic sick poor, and for children. It provided nearly 2000 beds in 28 red-brick two-storey pavilions, many of which were connected by corridor. It had 1,867 beds, of which 200 were for psychiatric assessment. During the First World War, the hospital was used for wounded servicemen and known as the 3rd and 4th Scottish General Hospitals. In 1930, Stobhill became a Glasgow Corporation hospital. The Western District Hospital, locally known as Oakbank Hospital, was built in 1902-04 for the treatment of acute medical and surgical cases. It was sited on a triangular plot bounded by Possil Road, Garscube Road and a canal. Like Stobhill, it was taken over for military use during the first World War. It joined the National Health Service in 1948 but closed in 1971. Eastern District Hospital, also known as Duke Street Hospital, was built as a 240 bed acute hospital and opened in 1904. It has been suggested that the hospital contained the first psychiatric assessment wards to be incorporated in a Scottish general hospital. It joined the National Health Service in 1948 under the Board of Management for Glasgow Royal Infirmary. It finally closed in 1996. 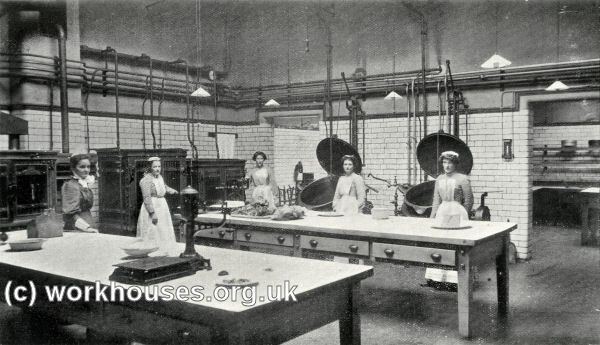 Glasgow Eastern District Hospital kitchen, early 1900s. Other city-run establishments for the poor were the Glasgow Dunclutha Home and the Glasgow Training School for Girls in Dunoon. Mossbank Industrial Schools, Hogganfield. It was intended to "lay hold of and educate neglected and destitute children who, having no parents, or worse whose parents living themselves in vice and profligacy, leave their offspring to grow up in ignorance or become vagrants and criminals." It taught 400 boys trades and 200 girls domestic duties. Buchanan Institution, 47 Greenhead Street. For the education and industrial training of destitute boys. House of Refuge and Night Asylum, North Frederick Street. Night Asylum for the Houseless and House of Industry for Indigent Females, 71 North Frederick Street. Glasgow Home for Deserted Mothers, 308 Renfrew Street. Training Homes for Canada (Boys), Cessnock House, Govan Road. Training Homes for Canada (Girls), Elmpark, Govan Road. Deaf and Dumb Asylum, Prospect Bank, Queen's Park. Stobhill Hospital - Registers of operations (1920-39); Registers of deaths (1935-66); Daily returns of patients (1929-66); Official visitations report book (1903-53); Maps and plans, 1889-1954. Western District Hospital - Maps and plans (1900-65); various other records (1950-65). Eastern District Hospital - Registers of patients (1904-73); Registers of nurses (1904-54); etc.